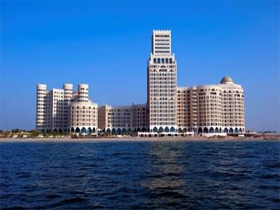 Al Hamra Palace Beach Resort - Ras Al Khaimah Discount Hotels, Resorts & Apartments!! Al Hamra Palace Beach Resort - Ras Al Khaimah Hotels, Resorts & Aparments United Arab Emirates with Special Discounted on Published Rates!! Description: Unwind and relax at the Palace Hotel, located on the pristine shores of the Arabian Gulf with the majestic backdrop of the Hajjar Mountains. Previously known as Al Hamra Residences, the Palace takes full advantage of its scenic location with enthralling rooms and a vast array of recreational activities. With the white sand beach just a stroll away and its close vicinity to the various tourism attractions of Ras Al Khaimah, The Palace Hotel gives you every reason to extend your stay and unwind. Accommodation: Al Hamra Palace Beach Resort has 117 splendid suites, each one with its own charm and individual appeal, have been designed to be warm and comfortable. Choose from sleek deluxe rooms and magnificent 1, 2 or 3 bedroom suites. Each hotel suite is spacious and contemporary, with expansive windows featuring sea/ mountain views. Premium quality beds, high-speed wireless Internet, and a fully equipped kitchen make both short and long stays hassle-free. Dinning & Entertainment: Choose from among three delightful restaurants and bars at the Palace Hotel - including mouth- watering international cuisine at the Sea Breeze Restaurant, salads & steaks at the beach view La Cabana Restaurant or poolside cocktail and snack at the Pool Bar. Also, you could dine at your convenience with 24-hour room service.